On Monday, November 26, 2018, Frictive Pictures held a one-time screening of a selection of films by UNB students and alumni that had previously screened at the Silver Wave Film Festival. UNB Faculty of Arts students and alumni made up a huge part of the festival this year. That is truly a testament to the amazing talent and incredible achievement of our students and alumni. students/alumni. The very first film shown in this category was Sister’s Dirge, written and directed by UNB Faculty of Arts alumni Ty Giffin. He produced this film for his Honours in Media Arts and Cultures, and the cast and crew were filled with UNB Arts and MAAC students and alumni. They even shot a scene in the Cellar Pub! The film won Best Student Short at the awards ceremony. This was a great screening opportunity for the numerous Arts and MAAC students who worked on the films. Small Town Danger, created by Tony Merzetti’s FILM2999 class, was directed by current UNB Arts student Luiza Lima and shot on 16mm celluloid. Social Proof, a co-production by Frictive Pictures and the Muriel McQueen Fergusson Centre that used verbatim research to examine cyberviolence, made its world-premiere. Directed by UNB student Ashley Morehouse and produced by UNB Faculty of Education professor Dr. Matt Rogers and education student Ashley Phinney, this film was nominated for Best Student Short at the awards ceremony. Actor and Supporting Actor categories, respectively. UNB alumni Jeremy Brubacher premiered his film ‘Into the Void’. Jared Carney, who completed his Film Certificate at UNB, had three films screen in the NB Shorts category; Wondering Eyes, Boneyard Gloom, and Infinity Land. The star of Infinity Land, Tony Tomarchio, won Outstanding Performance by an Actor in a Drama. Ryan O’Toole, Media Arts and Cultures graduate and former Artist in Residence at UNB, screened his experimental film krotoplaxx diary disc 1.1. Kaitlyn Adair, UNB employee and Nursing alum, premiered her film ‘March 2.4’, which she co-directed with UNB graduate Bronwen Mosher. Kaitlyn won both the Outstanding Performance by an Actress in a Drama award and the Lex Gigeroff Excellence in Screenwriting Award for this film. It was nominated in three more categories, including Best NB Short. Bronwen Mosher also premiered her film ‘Monkey See’. The lead, Quentin Palmer, was nominated for Outstanding Performance by an Actor in a Drama. UNB education professor Dr. Matt Rogers had two short films screen in the Short Documentary Matinee. Where you were born featured a crew exclusively of UNB students and alumni: Josh Vandenborre, Dylan Eddington, and Ty Giffin. He also co-directed Almost Home, which was edited by UNB alumni Jon Dewar (Sociology) and Ty Giffin (MAAC), and features drone footage by Renaissance College student Cameron Lane. For their dedication to the film community in New Brunswick, Frictive Pictures (UNB professors Matt Rogers and Robert Gray and UNB alum Jon Dewar) won the Jim Lavoie Film Professional Recognition Award. UNB graduate Amy Bourgaize showed her FHS class’s film from the What’s Up Doc? Film Program, called Somewhere on the Spectrum. Chet Wesley, former UNB professor, screened the documentary 12 Dogs Drive - The Run Home. Strike Pictures, featuring UNB graduates Gordon Mihan (Business admin) and Lance Kenneth Blakney (MAAC), screened their film Letters from the Dead. Directed by Arianna Martinez, co-written and produced by Gordon and shot by Lance, this film won Best Art Direction and was nominated in 7 other categories (including Best NB Short). Mnemosyne, directed by UNB Saint John graduate Tracey Lavigne, made its world premiere. The film won big, with 6 wins including Best NB Short and Viewer’s Choice Award, and was nominated in 5 other categories. The Faculty of Arts and UNB’s continued support of Media Arts & Culture, Film Studies and the Film Certificate, our collaborations with the NB Film Co-op and events like the 48 Hour Film Competition have an incredible impact on filmmaking in New Brunswick. 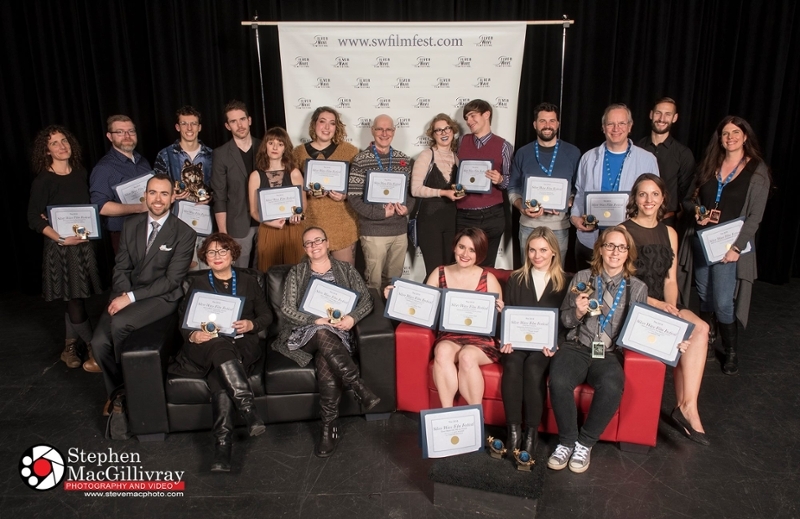 It was an excellent year of films and congratulations to the winners as well as all the UNB and Faculty of Arts students and faculty who acted, wrote and made films this year.